Once again, our customers spoke and we listened - our customers needed documentation to help them prove the existence of a "vulnerability management program" to address this common requirement in vendor contracts and newer regulations. Similar to the other cybersecurity documentation we sell, many of our customers tried and failed to create their own program-level documentation. It is not uncommon for organizations to spent hundreds of man-hours on this type of documentation effort and only have it end in failure. That is why we are very excited about this product, since it fills a void at most organizations, both large and small. The VPMP addresses program-level guidance on HOW to actually manage patching and vulnerability management, including vulnerability scanning and penetration testing. Policies & standards are absolutely necessary to an organization, but they fail to describe HOW vulnerabilities are actually managed. The VPMP provides this middle ground between high-level policies and the actual procedures of how systems are patched, systems scanned, etc. on a day-to-day basis by those individual contributors who execute vulnerability management tasks. For your internal staff to generate comparable documentation, it would take them an estimated 150 internal staff work hours, which equates to a cost of approximately $9,650 in staff-related expenses. This is about 2-3 months of development time where your staff would be diverted from other work. If you hire a consultant to generate this documentation, it would take them an estimated 80 consultant work hours, which equates to a cost of approximately $22,400. This is about 1-2 months of development time for a contractor to provide you with the deliverable. The VPMP is approximately 7% of the cost for a consultant or 14% of the cost of your internal staff to generate equivalent documentation. We process most orders the same business day so you can potentially start working with the VPMP the same day you place your order. The VPMP can serve as the cornerstone in your organization's technical vulnerability management program. It can stand alone or be paired with other specialized products we offer. 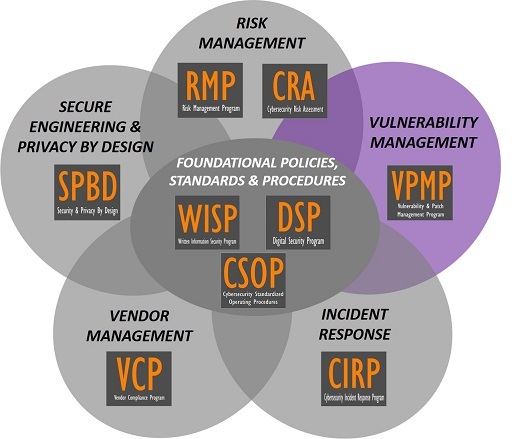 The Vulnerability & Patch Management Program (VPMP) is framework-independent (e.g., ISO, NIST, COBIT, etc.) and was designed to integrate with our Written Information Security Program (WISP) and Risk Management Program (RMP) documentation - this allows you to have policies, standards and procedures that work together to create a holistic and comprehensive cybersecurity program! The VPMP was one of the most challenging documents we've developed over the last decade. The reason for this is the need to address and unify various components that are complex on their own - patching systems, vulnerability scanning, remediation activities and penetration testing. What this program-level document establishes is the framework to provide direction to and govern those functions, regardless of who is actually doing the work. Depending on the makeup of the organization, it can be pure IT, cybersecurity personnel, outsourced staffing or a combination of all. Given the cost associated with the effort to create a documented vulnerability management program from scratch, the VPMP priced to be affordable to all organizations. What Is The Vulnerability & Patch Management Program (VPMP)? Who is responsible for managing vulnerabilities. What is in scope for patching and vulnerability management. Defines the vulnerability management methodology. Defines timelines for conducting patch management operations. Considerations for assessing risk with vulnerability management. Vulnerability scanning and penetration testing guidance. Information Assurance (IA) guidance to support secure engineering activities. What Problem Does The VPMP Solve? Lack of In House Security Experience - Writing security documentation is a skill that many good cybersecurity professionals simple are not proficient at and avoid the task at all cost. Tasking your security analysts and engineers to write comprehensive documentation means you are actively taking them away from protecting and defending your network, which is not a wise use of their time. It is not uncommon for organizations to spent hundreds of man-hours on this type of documentation effort and only have it end in failure. Compliance Requirements - Nearly every organization, regardless of industry, is required to have formally-documented security policies and standards. Requirements range from PCI DSS to HIPAA to NIST 800-171. The WISP is designed with compliance in mind, since it focuses on leading security frameworks to address reasonably-expected security requirements. 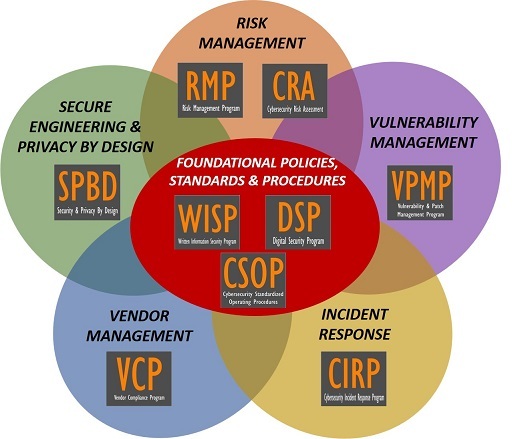 The WISP maps to several leading compliance frameworks so you can clearly see what is required! Audit Failures - Similar to risk management, most organizations run into trouble in audits when asked HOW vulnerabilities and patches are managed, since they cannot provide documentation beyond policies and standards. The VPMP addresses the HOW for you! Vendor Requirements - Requirements such as PCI DSS, MA 201 CMR 17.00 and NIST 800-171 establish a mandate to formally manage vulnerabilities. The VPMP addresses these compliance requirements! How Does The VPMP Solve It? Clear Documentation - The VPMP provides the comprehensive documentation to prove that your vulnerability and patch management program exists. Time Savings - The VPMP provides actionable guidance on what steps can be taken to proactively address risk and keep systems patched in a sustainable manner. Alignment With Leading Practices - The VPMP is written to support leading practices for patching, vulnerability scanning, penetration testing and vulnerability remediation. Who Typically Buys This Product? A risk assessment identified remediation efforts as deficient and the issue needs to be remediated to remove it from the risk register. Why You Need A Documented Vulnerability & Patch Management Program! Our documentation is meant to address your requirements from strategic concepts all the way down to day-to-day deliverables you need to demonstrate compliance with common statutory, regulatory and contractual obligations. We offer up to 40% discounts on our documentation bundles, so please be aware that you have benefit from significant savings by bundling the documentation you need. You can see the available bundles here. We are here to help make comprehensive cybersecurity documentation as easy and as affordable as possible. We serve businesses of all sizes, from the Fortune 500 all the way down to small businesses, since our cybersecurity documentation products are designed to scale for organizations of any size or level of complexity. Our affordable solutions range from cybersecurity policies & standards documentation, to NIST 800-171 compliance checklists, to program-level documentation, such as "turn key" incident response, risk management or vulnerability management program documents. Our focus is on helping you become audit ready!